Paul Todd/Getty Images Puma sent 10 bloggers to Abu Dhabi for a week to provide unique coverage of the Volvo Ocean Race. 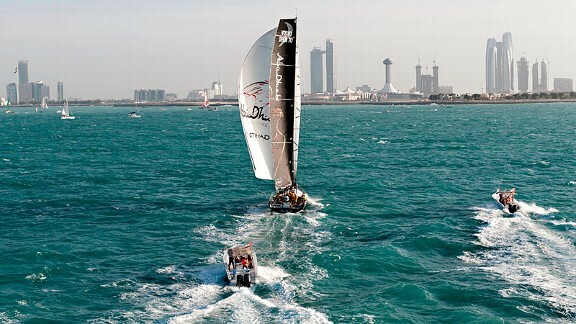 The Volvo Ocean Race spans from November to July with stops on six continents. When sailors reached Abu Dhabi, the third leg of the grueling event, they encountered more than dry land. Independent bloggers -- sent to the race by Puma -- have been on hand to chronicle the stop. According to Puma manager of digital media projects Andrew Schmidt, the idea was born from Tumblr sending bloggers to cover New York Fashion Week. Schmidt believed that Puma could use a similar model at a sporting event. The triennial yacht race, in which Puma fielded a boat this year, seemed a perfect fit. So Schmidt selected 10 bloggers -- specifically Tumblr and Instagram users -- to chronicle the race's stop in the Middle East last week. Puma paid for their travel and lodging, and the bloggers documented the experience, tagging each photo with #marmostro (the name of Puma's boat) and posted the content to their own sites, followers and social media networks. The fact that Puma is using newer social media platforms when social media is often thought of as Facebook, Twitter and then everything else is also significant. "We've been exploring how to leverage some of the newer technologies that are out there, ones that are starting to come up," Schmidt said. "It's important for us to see what's next: What's the next Facebook? What's going to be Twitter in two years?" While he doesn't have the answers to those questions, there's one thing he is certain of: the potential for this kind of reporting at future major sporting events. "We could take this model and use it on a number of different things," Schmidt said. "Whether it's the Olympics or the World Cup or the World Championships for track and field, anything else we have that we're looking to create a buzz around digitally." The Volvo Ocean Race ends in Galway, Ireland, in Summer 2012, but the social media adventure is just beginning.